Blog Is It Hard To Believe That God Does Whatever He Wants? 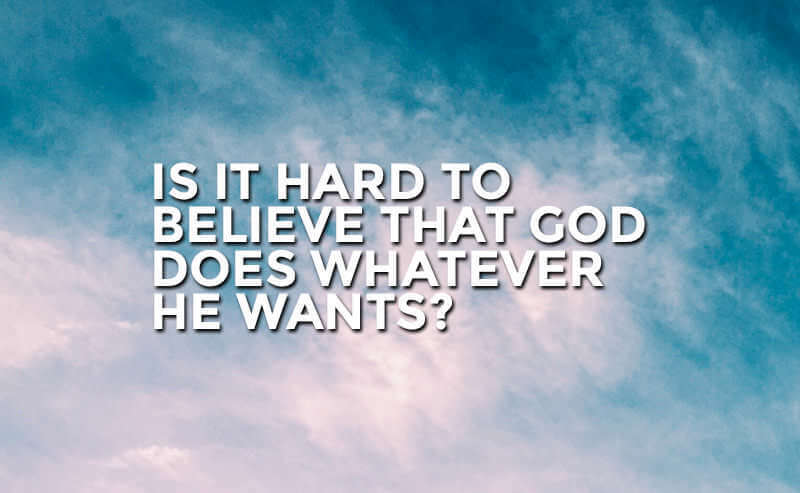 Is It Hard To Believe That God Does Whatever He Wants? Whenever we experience the shock of a painful situation, our capacity to cope with what has happened diminishes. There is an instant demolition in the world we used to know. We come face to face with what we believe the world should be like and what the world actually is. The truth is, life is full of pain, suffering, and adversity. Some of us will walk unimaginable paths that are flooded with a hurricane of tragedy and heartache. Through these valleys of death, some of us will stare straight into the eyes of God’s sovereignty and will have to choose whether or not we trust Him, completely. Walking through the valley leaves us wondering why God would freely allow such immense pain to enter into our lives? Why would He let us suffer even though we have loved Him and been faithful to Him? When enduring inconceivable suffering, it is often hard to remember that God is still good, still loving, and still in control of ALL things. Knowing that God would be part of and allow such pain into our lives is a hard truth to swallow. I have come to learn through my own valleys of death that without understanding God’s sovereignty, we will never understand suffering. And if we do not understand suffering, we will never learn how to suffer well for the glory of God. It has been through seasons of my deepest heartache where I have learned that God is in control over all things, including my suffering. It is through my suffering that God has and continues to sanctify me, making me whole and more like Him. 1 Peter 1:6-7 says: In all this you greatly rejoice, though now for a little while you may have had to suffer grief in all kinds of trials. These have come so that the proven genuineness of your faith-of greater worth than gold, which perishes even though refined by fire-may result in praise, glory and honor when Jesus Christ is revealed. In the midst of my greatest trials, God teaches me what it means to fully trust Him and praise Him. In those moments of trusting Him and His great purpose, God is glorified because we are choosing to bow to His sovereignty. The Sovereignty of God is breath taking. Most of the time we will never come to understand why God allows such grief into our lives, but most often it is through the valley of the shadow of death where God reveals His ultimacy, His authority, and His deep love for us. It is through the greatest adversity where we learn to trust His sovereignty.